Happy Monday! I hope everyone had a nice weekend. I enjoyed another low key one, which was very much needed. I feel like I've been nonstop lately, and sometimes the best weekends are spent at home with the family. The weather was beautiful, free of humidity, and I could finally enjoy a glass of wine out on the deck again without sweating, or my hair frizzing, ha! It actually was cool enough, I almost needed a sweater, which got me excited for the fall. Although I'm not anywhere near ready for summer to end, I decided it was time to stop shopping for summer clothes (unless I find something amazing on sale) and start building my fall wardrobe, which leads me to this suede skirt. This is another purchase I made during the Nordstrom sale, along with these flats, and I'm obsessed. I love how it has the zipper detail, which makes it a little different from all of the button front skirts we've been seeing. The rise is also slightly higher, which we all know I love. I paired it with an easy white top for a summer look, but know I'll be wearing this skirt through the fall and winter with a great sweater and pair of boots. I wish everyone a happy and productive week. Thank you for stopping by! Super cute look! Love the suede skirt and studded flats. Love the groovy suede skirt and that blouse is tres chic. Your accessories today are simply beautiful, also. This look has me ready for fall! 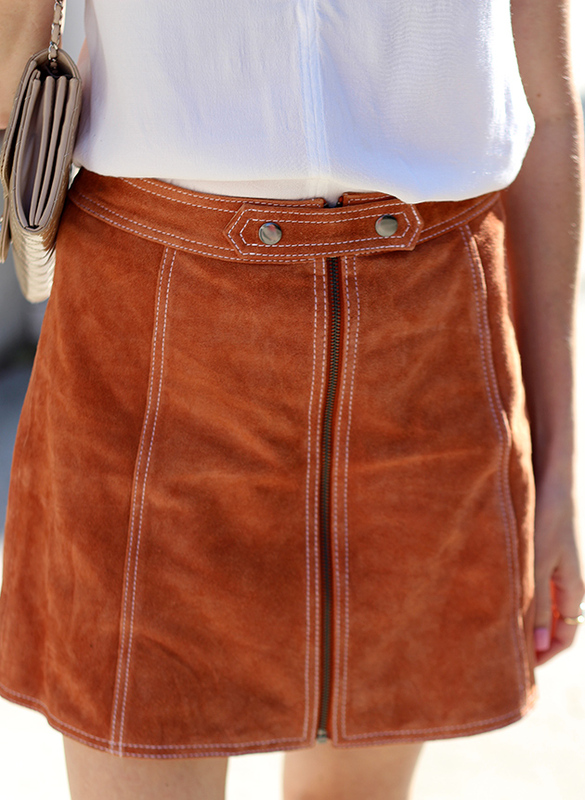 I need this suede skirt in my closet, like ASAP. This is adorbale! Loving the suede look right now! Love the suede. Such a hot trend right now. That skirt is so good! The color and texture are so beautiful. I can easily see it styled up in the Fall time! You look so lovely like you always do! Beautiful, what a great piece to carry you into the fall season. That skirt is amazing, it looks so vintage and adorable! Great outfit! Gorgeous outfit! You have a great sense of style. Such a great skirt! And those flats look amazing on you! 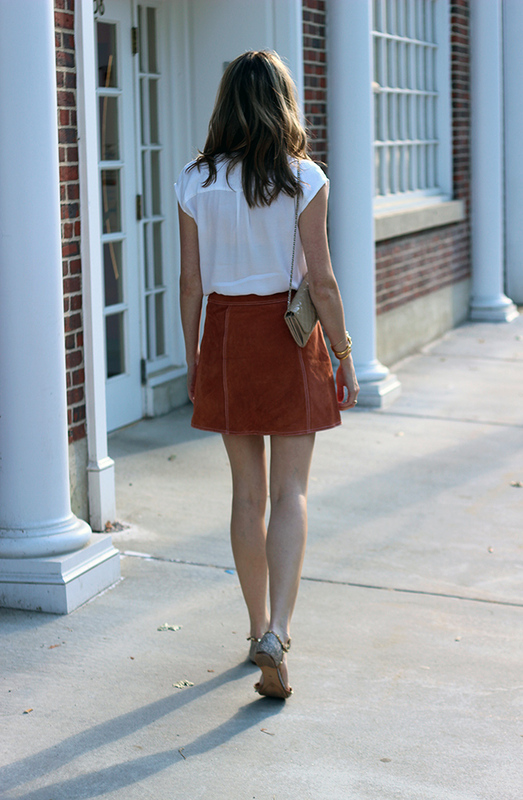 Your suede skirt is beautiful, what a wonderful piece to transition into fall. I love that we were twinning and on the same day! The top and shoes you styled your skirt with are fab. You are killing this pretty suede skirt, lady! Gorgeous! 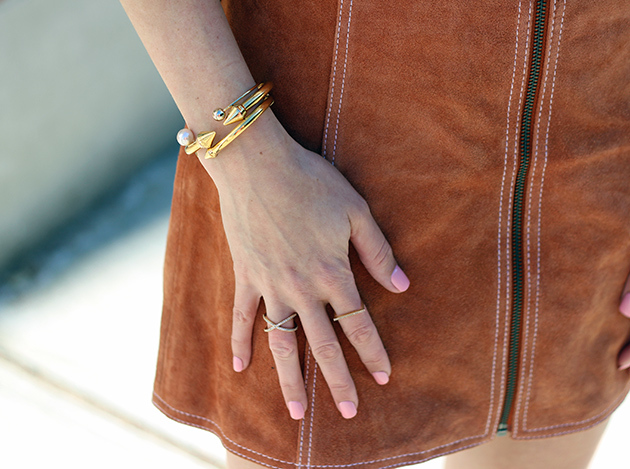 Love suede especially in a skirt! Thanks for linking up with Whitney, Casey & Carrie. You look gorgeous in that skirt. And those shoes...I need them! What a gorgeous outfit! Totally love that suede skirt! I am in love with that skirt!!! It's gorgeous and looks so good on you. It will be such a fun piece to style for fall!